I have another beautiful holo from the ILNP's spring collection today. I'm so impressed with these, as they are the first pastel holos I've ever owned. I was always wanting pastel holos, and ILNP nailed these (pun intended)! I have 5 from the collection already, but I'll definitely be picking up some others I missed later on. This next one is a gorgeous purple. 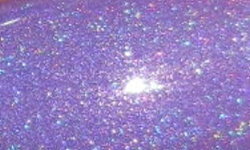 Charmingly Purple is a bright lavender holo. Color: Beautiful shade of purple. I absolutely love lavender shades. This color is soft, but saturated. The holo pairs nicely with the base. Formula: Excellent easy to apply formula. I used 3 coats. Price: This is $10.00 on ILNP's website. Overall: This is one of those polishes I feel speaks for itself. I'm not sure I can add much to enhance how beautifully awesome it is. I think you will be impressed with Charmingly Purple if you purchase for yourself. What a gorgeous pastel holo! I don't own any pastel holos so its great to hear that these are good. This is just so beautiful on you, Steph! This is such a gorgeous purple, I love it! Wow, chick this polish is AMAZING on you! So pretty. I need to get the new holos. Love the base color of this! So pretty!